Imagine riding your bike the length of El Camino Real from San Jose to Daly City. A nightmare. I did it, once. 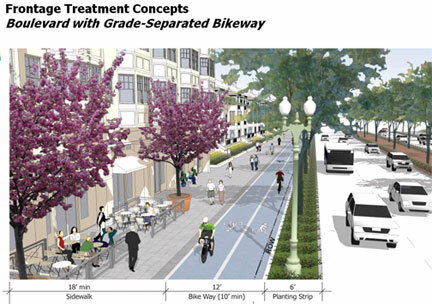 Now there’s a plan to “remake” El Camino Real and it may, or may not, be a good deal for cyclists. In no way will El Camino Real ever be a great bike route, but it could be more tolerable for short distances if some of the makeover plans come to pass. 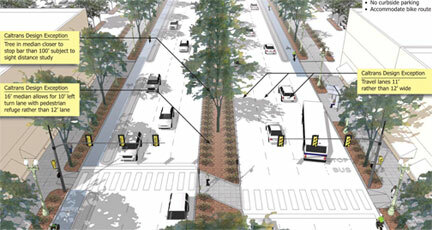 The Grand Boulevard Initiative has published some options. You can voice your opinion today. A couple of options have promise, but there’s one I would avoid. Bikes are much better off mixing with cars than they are with people. Believe me. I’ve ridden through the Stanford campus at peak hour. Not a pretty picture. No matter what plan the 19 cities, two counties, the state, and a host of agencies come up with, it’s going to be a compromise. Everyone has a stake. In my mind, eliminating parking on El Camino Real is essential. Let’s give priority to bus, pedestrian, and bike traffic. I don’t know where the money will come from to spiff up El Camino in this woeful economy, so don’t hold your breath on this one happening any time soon. Good idea. Wide lanes with room for bikes. No complaints here. Bad idea. Bikes mixing with pedestrians. Put us with the cars. This entry was posted on March 8, 2010 at 2:32 am and is filed under News. You can follow any responses to this entry through the RSS 2.0 feed. You can leave a response, or trackback from your own site. In most instances, I do agree that mixing bikes with pedestrians is a bad idea (i’m picturing the embarcadero promenade right now). However, if you’ve been to crissy field, that has a setup similar to the diagram above, you can see that for the most part people stick to their side of the path, and that it can work. Overall, I agree that I myself would prefer a bike lane on the road. El Camino used to be a great ride until the late-70s. I used to ride it weekly from BART to the Sunnyvale twilights in the mid 70s, and from Palo Alto to Mt Hamilton Rd before then. In those days the only difficult sections were through Burlingame and downtown San Jose. But Caltrans (before DD-64) ruined it by adding auto lanes without regard for cyclists., as they did with many, many roads that cyclist have had to avoid since.